Caldecote Reserves v Flitwick Town Reserves. Picture: David Kay. Wilstead are now the only Bedfordshire League Premier side with a 100% record after a 3-1 victory at Sharnbrook on Saturday. It has sent them three points clear at the top of the Premier Division supported by Sportsform. Lewis Duffield, Aldo Simms and Paul Jones scored the vital goals against a lone reply via Louis Green. Goal difference now only separates the cluster of six clubs who sit between second and seventh place. Last season’s champions AFC Oakley M&DH lead the way following their 7-1 home victory over Caldecote. Shaun Barnett scored a hat-trick and was joined on the scoresheet by Matt Barnes, Robbie Alder, Hal Wood and Jason Goldman against a lone visitors reply from Jack Boyd. In third spot are Wootton Blue Cross who ran out 5-0 home winners of now bottom of the table Sandy. Jamie Rodd with a hat-trick was joined on the scoresheet by Jamie Sawyer and Dean Abrahams to bring up the nap hand. In fourth place are Ickwell & Old Warden who won 3-1 at Kempston Rovers Development thanks to a brace of goals from Steve Thomas and a single strike from Ashley Boness against a lone Rovers reply from Munashe Sundire. Whilst in fifth are Renhold United who ended Stevington’s 100% record by beating them 2-1 at their Playing Field headquarters. Aran Hazelwood and Ashley Drummond were on the United scoresheet against a Stevington reply from James Bourke who now sit in sixth in the league. Seventh are Flitwick Town, 2-1 home winners over AFC Kempston Town & Bedford College. Phil Matthews and Dan Stafford grabbing the home goals against a lone reply from Courtney Boughton. Elsewhere there was a first win of the season for the now eighth Shefford Town & Campton who ran out 3-1 home winners over Ampthill Town Reserves thanks to goals from Ryan Lewis, Tom Scurfield and Ollie Walton against a lone reply from Gulian Lusambya. 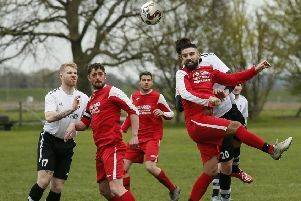 Cranfield United’s quest for Wembley glory saw them held 2-2 at home by South Midlands League side Southall. Adam Hulks drew them level to see the scoreline at 90 minutes 1-1 before Martin Holland hit the late equaliser to take the game to a replay. The early season leaders of Division One supported by Wests Citroen are Crawley Green Reserves who notched up win number two on the bounce when winning 4-3 at Totternhoe Reserves. Andrew Randall with a brace was joined on the scoresheet by George Nivan and Jack Randall against home replies via George Carter, Steve Buttress and Berkim Luikaj. They lead the way on goal difference from Meltis Albion who also maintained their own 100% record when winning 3-0 at Old Bradwell United Reserves, Scott Alleyne netting twice and Surinder Raj once. However the stand out result of the afternoon saw Queens Park Crescents open their season by winning 14-1 at Ickleford. Danny Rosol, Mohammed Abbass and Shahiaur Rahman all scored hat-tricks, Mohammed Jabber and Ayaz Hassain joining in with braces and joined on the scoresheet by Alip Otocki against a lone home reply via Giuseppe D’Angelo. Also starting off their season with a big win were AFC Kempston Town & Bedford College Reserves who ran out 6-1 home winners over Cople & Bedford SA. Jesse Sidhu led the way with a hat-trick, Kurtis Alleyne hitting a brace and joined on the scoresheet by Giovanni Moscartiolo against a lone Cople reply from Ollie Hughes. There were also six goals for Westoning who saw off M&DH Clapham Sports at Greenfield Road with a 6-5 victory. Thomas Cooksley and Ben Dashwood both scored twice alongside single strikes from Sam Taylor and James Lovett. The M&DH replies came via a Marko Tobzic hat-trick plus strikes from Liam Bolton and Glen Tumulty. For both Henlow and Elstow Abbey there were away wins to kick of their seasons. Abbey, thanks to a 16th minute goal from Lucas Banton, won 1-0 at The 61 FC Luton Reserves. Henlow were 3-2 victors at Shefford Town & Campton Reserves. Luke Hills, Russell Bull and Paul Wright netted the vital goals against Town replies via an own goal plus Malcolm Marimirofa. Wixams lead the way at the head of the Division Two following their 4-2 victory at Sundon Park Rovers, Gaz White netting three times and Adam Jellis once against Rovers replies via Nick Buttigeig and Daniel Longalonga. Just goal difference behind them and still 100% for the season are Atletico Europa who ran out 7-0 home winners over AFC Oakley M&DH Reserves. Mo Banda with a hat-trick was joined on the scoresheet by Kudzai Madziuanyild who netted twice to go alongside single goals for Tadej Jankovic and Paddy Alemanji. Over at Mill Lane it was a 2-2 draw for Potton Town against Lea Sports PSG. Chris Cooper and Jordan Thomas were on the Town scoresheet against PSG replies via Ryan Darby and Rhys Cadger. Whilst also sharing the points were Caldecote Reserves and Flitwick Town Reserves at Harvey Close. Chris Richardson scored for the home side and Sean O’Donnell was on the mark for the visiting Town in a 1-1 draw. The final game of the day in this section saw Kempston Hammers Sports earn their first win of the season with a 3-2 home victory over Houghton Athletic. Jimmy Grandidge, Shaun Winconek and Chris Greene were the Hammers marksmen against Athletic replies via Ali Mohiyaldeen and Troy Walker. The early season pacesetters in Division Three are Marston Shelton Rovers Reserves who ran out 6-1 home winners over AFC Dunton. Gary Russon with a brace was joined on the scoresheet by Jake Cullum, Kieran Day, Lewis Steele and Dean Clark against a lone reply from Brandon Bates. They lead the table by two points from Kempston Athletic who were 7-3 winners at Caldecote A, Josh St Clair Pierre netting four times, Gary Whitbread twice and Jahmal Hibbett once for the Athletic against home replies via Joe Rowley, Jamie Richardson and Robert Salvaggio. Also still unbeaten for the season are third place Wilstead Reserves who were 3-1 home winners over Renhold United Reserves. Joe Sullivan, Robert Lilley and Luke Prietzel scored the vital goals against a lone United reply from Tom O’Neill. Whilst Shefford Town & Campton A recorded their first win of the season with a 2-1 victory at Wootton Village. Scott Frusicante and Matthew Evans on their scoresheet against a lone Village reply from Adam Flynn. Topping the standing in Division Four are league newcomers CS Rovers who maintained their 100% seasons record with a 5-2 win at Sandy Reserves. Lorrell Smith led the way with a hat-trick and joined on the scoresheet by Connor Darocha and Ultan Coonan to bring up the nap hand against home replies from Matt Brown and Aiden London. Just goal difference behind them in second are Dinamo Flitwick who won 4-1 at Stevington Reserves thanks to strikes from Dale Goldie, Scott Hannam, Nick Payne and Alex Sommers against a lone home reply from Jamie Endersby. For another of the league’s newcomers Harlington, it was a start to life in the league by winning 5-3 at Lidlington United Sports. Farrel Whitman with a hat-trick was joined on the scoresheet by Ben Whalley and Jordan Batchelor to bring up the nap hand against home replies via Alex Stubley, Greg Roberts and Ryan Kirby. Whilst Clifton claimed their first win of the season with a 1-0 victory at Henlow Reserves thanks to a goal from Josh Angell.